There are often a lot of claims about all the amazing things that vitamins can do for us – often with very little supporting evidence. There is one area, however, where certain vitamins have been shown to play an important role and that is in the fight against ageing. The old adage of “You are what you eat” is certainly true. What you put on your plate, in your mouth and into your belly can have a huge impact on not only your health but also your lifespan. In fact, while most people are concerned with the outward signs of ageing – such as the wrinkles and greying hair – it is the internal deterioration over time – and the diseases that result from this - that should really get you worried. And what causes this “internal ageing”? A set of tiny particles called “free radicals”. The by-products of everyday metabolic processes, free radicals are unstable molecules that attack and damage cells, leaving them vulnerable to diseases and leading to the changes and deterioration we call “ageing”. Researchers now believe that free radicals play a pivotal role in almost every age-related disease, such as Alzheimer’s Disease and arteriosclerosis. There is hope, however, as substances called antioxidants can successfully neutralise free radicals by binding to them and effectively “mopping them up” before they cause any further damage. And it so happens that certain vitamins are some of the most effective antioxidants around. These include Vitamin A, Vitamin B, Vitamin E and Vitamin D.
This vitamin is often considered the most important antioxidant of all as it protects cells membranes from damage, as well as their associated enzymes. It is believed to inactivate free radicals, so that they have less ability to cause damage – and also play an important role in prolonging the lifespan of red blood cells. Several research studies have shown that applying creams containing vitamin E to the skin can reduce sun damage and limit the development of cancerous cells. 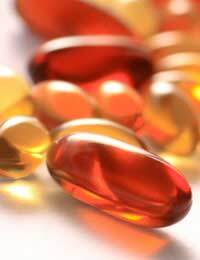 Taking vitamin E supplements daily is also believed to reduce wrinkles, sun damage and improve skin texture. However, it is best to ingest the vitamin through natural sources, such as vegetable oils (e.g.. sunflower oil), oats, grains, nuts and dairy products. Perhaps the next most important anti-ageing vitamin after vitamin E, vitamin C also plays a pivotal role in binding to free radicals and preventing them from causing cell damage leading to the ageing process. They play a particularly important role in protecting the skin from environmental stressors such as pollution, smoking and of course, the no. 1 ageing factor: sun exposure. In fact, even low levels of UV exposure can reduce Vitamin C levels in the skin by 30% – and exposure to ozone from city pollution can decrease levels by as much as 55%. Interestingly, while Vitamin C is most beneficial in the skin, it has been hard to create a skin cream which can deliver Vitamin C satisfactorily to the skin because it reacts immediately when it is exposed to oxygen. Nevertheless, work is ongoing to produce more effective, stable formulations. However, it would seem that it would be better to obtain your vitamin C through your diet rather than through creams, so make sure you eat plenty of leafy green vegetables, berries and citrus fruits. This vitamin actually exists in 2 different forms known as retinol and beta-carotene. Retinol is a well-known ingredient in anti-ageing skin creams and is one of the few that has been well-studied and proven to work. However, retinol can irritate some people with sensitive skin and it can also increase your sensitivity to the sun’s UV rays so it needs to be used with care. Beta-carotene is also well-known for its anti-ageing properties. It works in conjunction with other antioxidants, such as Vitamin C and E, to protect cells from free radicals and combat the ageing process. Beta-carotene is found in orange, yellow and red coloured foods, such as carrots, red peppers, pumpkin and sweet potato as well as in dark green leafy vegetables. They are actually absorbed better when cooked as this loosens the carotene from the fibre of the vegetable and therefore makes more of it available for the body to use. With the health and anti-ageing benefits of all these vitamins, it is no surprise that the vitamin supplements industry is booming. However, remember that it is generally better to acquire your intake through natural dietary sources – e.g.. fruits and vegetables – rather than through popping pills. Questionnaire: Are You Eating an Anti-ageing Diet?